Before the mail-in ballot, before the punch card, Americans exercising their right to vote would walk into a curtained booth and pull the lever of a voting machine. 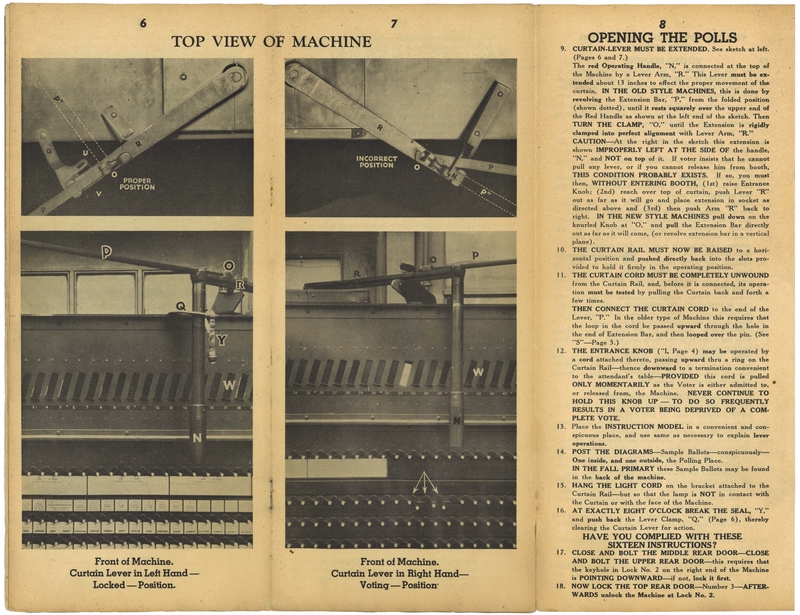 Lever voting machines were widely used across the country from the early 1900s well into the 1960s. 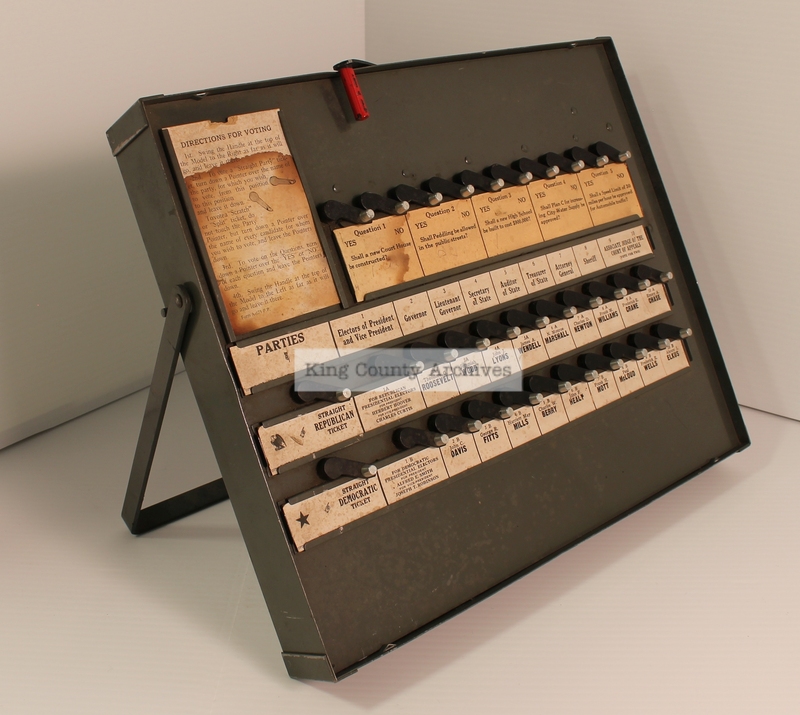 The Archives’ collection of elections artifacts includes two instructional models of lever voting machines. Such models were used to familiarize voters with what they would encounter in the voting booth. The two machines display the ballots of their times: King County’s measures and candidates from 1908 and 1928, the latter (shown here) with Herbert Hoover on the Republican presidential ticket. 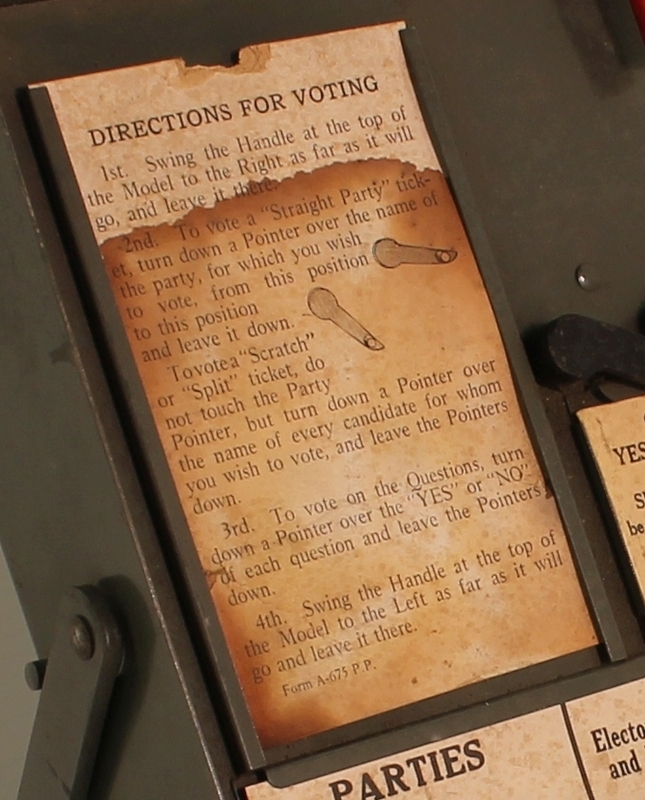 Voting machine instructional model showing 1928 ballot. Series 1202, Artifacts, Department of Information and Administrative Services, Records and Elections Division, 1202.2, King County Archives. Also on the ballot were state and local offices and propositions to fund a new courthouse and a new school, to allow peddling, to increase the city water supply, and to set the speed limit for automobile traffic to 30 miles per hour. 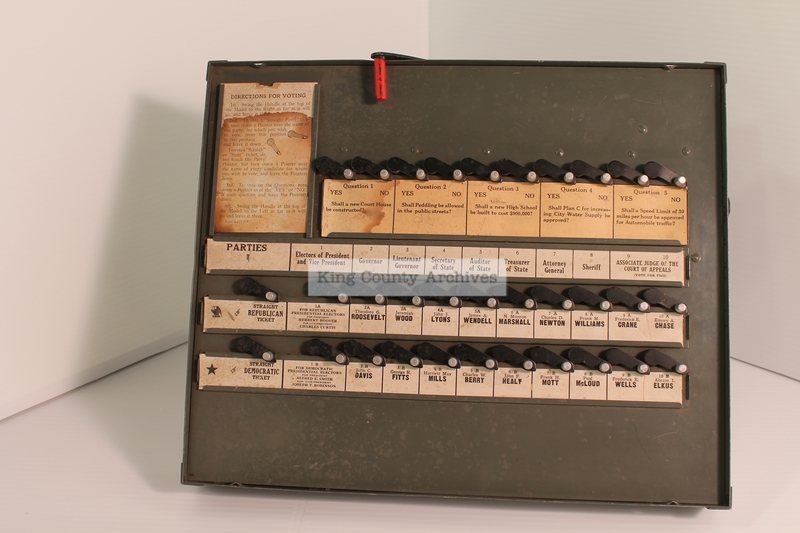 This machine gives us a feeling of what it used to be like to vote in King County. It might also lead us to think about how technology influences the way we participate in our democracy and ensure the integrity of our elections. The lever voting machine kept a tally of votes registered by the pull of a lever, rather than collecting individual ballots to later be counted. Data from the opening and closing of the voting booth curtain provided a check against the number of ballots cast and the count of voters. 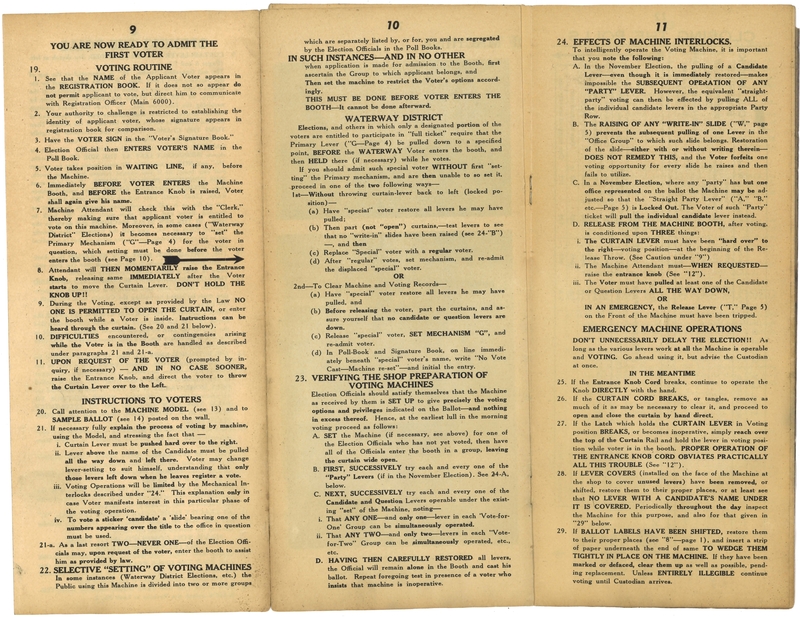 Pages and details from Instructions to Election Officers, Series 1202, Artifacts, Department of Information and Administrative Services, Records and Elections Division. 1202.2. King County Archives. Instructions to Election Officers, published by the King County Auditor, is preserved along with other elections artifacts. It instructed in administration of the voting process, including verifying voter eligibility by comparing with signatures in a registration book. 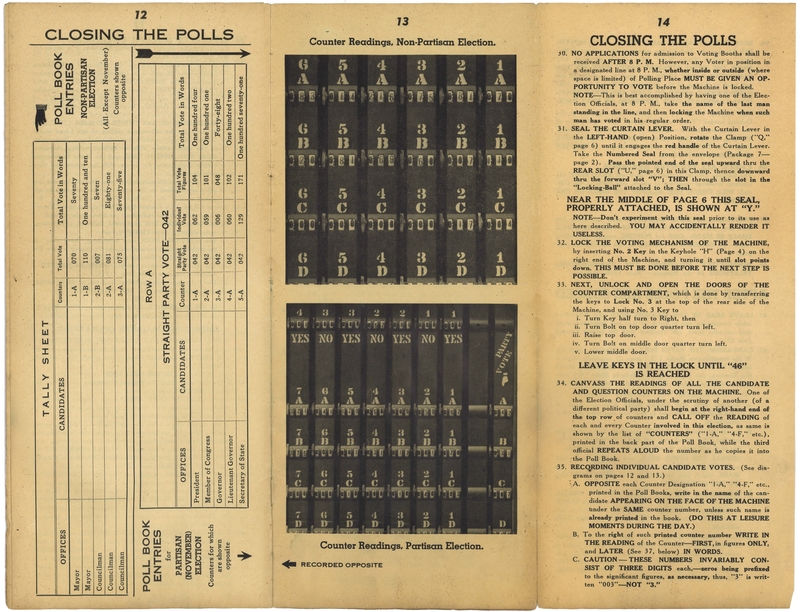 But the majority of the well-worn pamphlet was dedicated to careful set up and maintenance of the voting booths and lever machines. Malfunctioning gears could interfere with the count of votes. With no individual ballots for recounts, the accuracy of election results depended on the machine operating correctly. Voting was dependent not only on proper operation of the voting booth’s many moving parts, but also on the voter’s understanding of its use. For example, the curtain and voting levers both had to be in the proper position for the voter to be able to exit the booth. The voting machine models helped by showing people how to successfully cast their votes. In use for over half a century, lever voting machines seem cumbersome in contrast to Washington State’s current mail-in ballot system. Yet while the process has changed, voting today continues to rely on the direct or indirect interaction between contemporary technology and individuals — voters as well as officials and staff who are committed to the administration of fair and secure elections. For current information about voting in King County, visit King County Elections. Series 1202, Artifacts Information and Administrative Services, Department of: Records and Elections Division, King County Archives. A Brief Illustrated History of Voting, (http://homepage.divms.uiowa.edu/~jones/voting/pictures); Part of the Voting and Elections web pages, Douglas W. Jones, University of Iowa Department of Computer Science, Copyright 2001 and 2003.